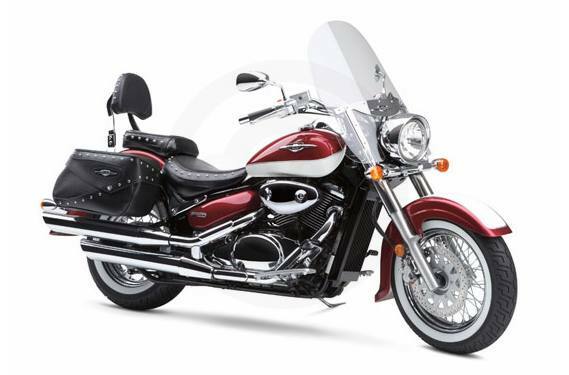 You may have seen the Suzuki Boulevard C50 around town, and with a stylish new two tone red/white color combination, it'll be sure to capture the spotlight wherever it goes. Now you have the chance to experience its awesome V-twin performance — and enjoy the benefits of key features designed for the open road. Meet the Boulevard C50T. Like the C50, it boasts a fuel-injected 45-degree V-twin engine that cranks out a load of torque down low, matched by exciting top-end performance. It also has a spacious riding position and smooth suspension for comfortable cruising. With a multitude of features, the C50T establishes its own unique identity. The C50T has an aerodynamic windshield and a custom-designed backrest, encouraging you to take to the open highway for true long-range cruising in maximum comfort. The C50T also has a range of custom features, from whitewall tires to studded seats, for its own bold look. The Boulevard C50T. A Classic cruiser that is as comfortable as it is stylish.